As burger month rolls on this week’s inspiration does not come from a local burger joint but my new sweet BBQ sauce. Besides, what’s the point of having a blog if I can’t shamelessly self promote my new products, I’ve got to create some hype. The new sauce will be available soon but for now it’s back to the burgers. I started by weighing out the beef in quarter pounds in balls and formed them into patties. On one side of each patty I made an indentation to help keep the patties flat during cooking. Then seasoned the patties with my BBQ rub and set them aside while I started the charcoal. 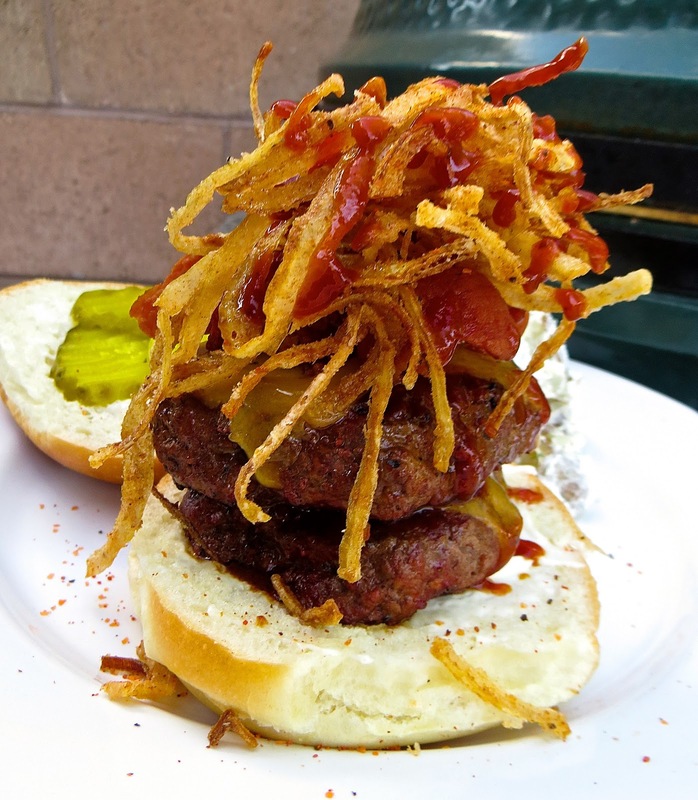 For a real BBQ flavor I cooked these burger over mesquite charcoal in the Big Green Egg. I cooked the patties at 450-500 for about 10 minutes, to an internal temp of 130º. 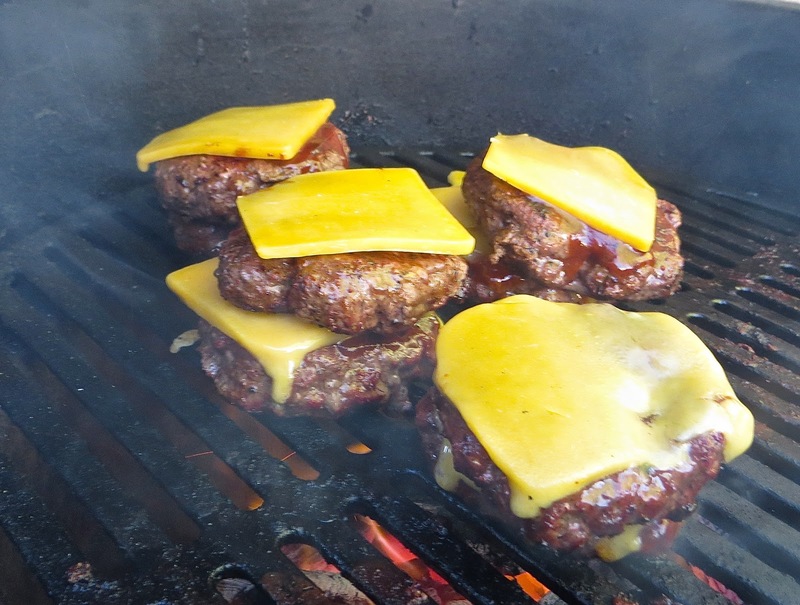 When I flipped the patties I poured some BBQ sauce over the top and allowed it to cook into the meat. A few minutes before the patties were done I topped them with the cheddar cheese and cooked for a few more minutes until the cheese has melted. Now for the onion straws, I sliced to onions into very thin strips and dredged with cornstarch and added some BBQ Rub. 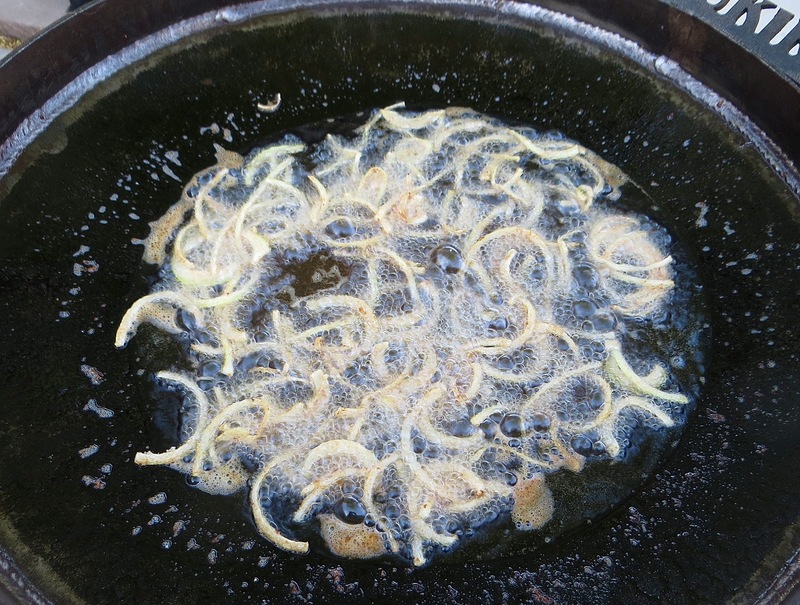 The onions were then fried in 375º oil for 2-3 min until golden brown. These straws were so tasty right out of the fryer I almost didn’t have enough for the burgers. Since I had disc full of hot oil I dropped my bacon in the oil and fried it up. With everything cooked it was time to assemble these beefy behemoth burgers. 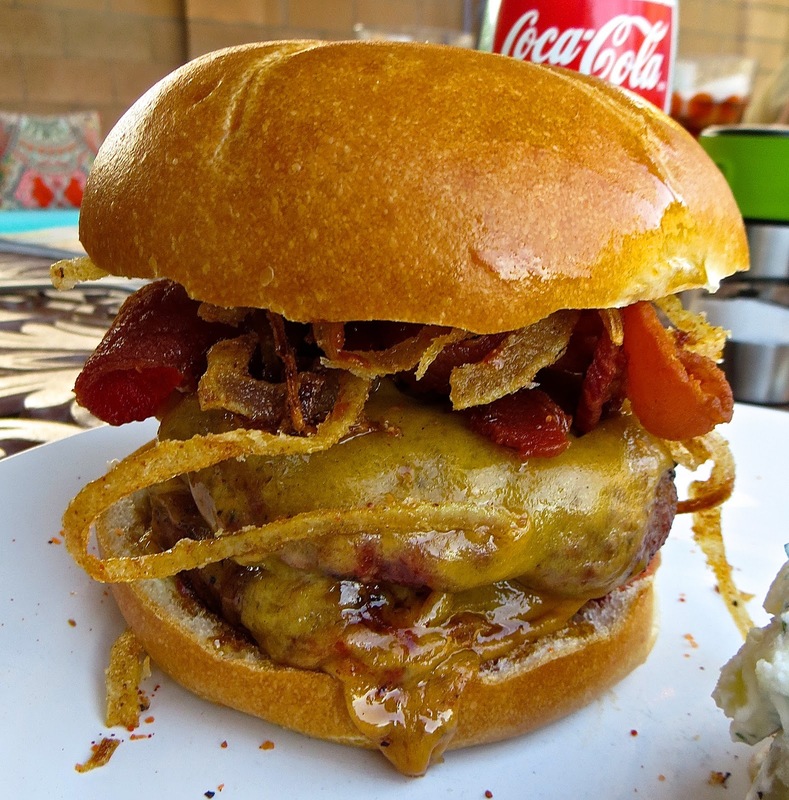 I started with the fresh Kaiser bun and added the beef patties that were just dripping with cheese, the added the bacon and then topped with a big pile of onion straws. After all that I drizzled the entire burger with the sweet BBQ sauce. Then I capped with the other half of the bun. Now for the hard part, getting this tasty tower of a sandwich into my mouth. Actually, I have a double-jointed jaw that I can dislocate to fit large bites of food into my mouth. Once I did get my first bite of this burger it was just spectacular. The smoky beef patties, the sweet bbq sauce, the crunch of the bacon and crispy straws this burger was just a mountain of flavors. Man was it good. I’ve got a few more burgers to do this month, but I think this one is going to be tough to beat. National Brisket Day is on a Tuesday?? Oh my – this looks like all my favorite things on one burger! Is 0730 too early to start drooling? That is my kind of burger!